Do you remember the episode of “Seinfeld” where George Costanza decided to do everything the opposite of what he normally would do even if it defied all logic, etiquette, and political correctness? Well, it worked for him, so we felt, with the utterly confusing state of this year’s Kentucky Derby, this was the perfect time to test that approach. When logic and analysis gets you nowhere, be a contrarian and try to defy logic an analysis. So, we did just that and guess what? We liked the results. In addition to this odd method of handicapping the Derby, we will revisit our exotics box based on our March 9 rankings of the top 15 horses we felt most looked like a Derby winner. And finally, we’ll break all this down and attempt to come up with a winner and a few savers, as futile as it may seem. Here is our exacta, trifecta, or superfecta box. Midnight Interlude – Because no horse since Apollo in 1882 has won the Derby without having started at 2. Archarcharch – No one wins from post 1, the least desirable post. The last horse to do it was Ferdinand 25 years ago. Nehro – Most of the clockers felt he had one of the least impressive, or maybe even THE least impressive, final Derby work. Soldat – No horse has ever won the Derby from post 17. Animal Kingdom – No horse has ever won the Derby who had never run on dirt. So, there you have the George Costanza five-horse box. We actually like this group a lot and give every one of them a good chance to win, especially considering all have been looking great physically. If you have the funds you can throw in Master of Hounds, who also qualifies by never having run on dirt. OK, now for our more serious bet. For our March 9 column flashback, before any of the major preps had been run, here are the horses we felt had the look of a Derby winner, based on the attributes it takes to win the Derby and what they had shown in 2011. Unfortunately, Toby’s Corner (#13) is out and he would have made this a much stronger group. But we still have six of our top seven in the Derby, and this our serious exotics box. They are: #1--Dialed In, #2--Mucho Macho Man, #3--Soldat, #4--Santiva, #5--Stay Thirsty, #7--Archarcharch. Again, this is a pretty solid group and some or all of these would make an enticing exotics box. Now for the nitty gritty. Not having seen most of the works, I can’t name my top work or even base my selection on works, From an observational standpoint, we can only go by gallops and overall physical condition. The top group consists of Pants On Fire, Animal Kingdom, Shackleford, Archarcharch, Brilliant Speed, Soldat, and Stay Thirsty. We also like the way Mucho Macho Man is coming around physically and he had an excellent gallop this morning. You can do with list this as you wish. We just mention it as a point of interest. Current observations: One horse in particular who has started to blossom physically and mentally in the past few days is Nehro, and despite his so-called unappealing breeze, he looks like he could be sitting on a big race. Another horse who looked fantastic this morning is Brilliant Speed, as he has the last couple of mornings. He looks extremely focused and coiled, and has the look of a true stayer. If he can run to his looks watch out for him at a huge price. Now let’s sort through all this and see what we have. We’ve already gone over the exotics plays. Narrowing it down to one pick, we have been a fan of Archarcharch all year ever since he won the six-furlong Sugar Bowl Stakes in 1:10 2.5. He possesses the most explosive turn of foot on the far turn, he has a strong pedigree, and he’s been training super. Despite his drawing the dreaded rail, we have to stick with him and just hope he can overcome it. No horse’s coat looks better than his and if Court can get him back to midpack and avoid serious trouble he could still wind up getting a good trip. But he is in a precarious spot and needs a lot of luck and help from the Derby gods. Because of the uncertainty of Archarcharch’s post, we’re also going to focus on Nehro because of the way he’s been looking and acting. It just depends on his odds. Four horses we definitely are going to save with at a huge price are Brilliant Speed, based mostly on how good he's looked on the track, Master of Hounds because of the unknown factor, his big effort at 1 3/16 miles against a top-quality field, and getting Garrett Gomez, Shackleford because of his powerful works and gallops and the amount of time he’s been training at Churchill, and Animal Kingdom, who also has looked super in his gallops and his last work. This morning he galloped in blinkers for the first time, which is an interesting touch. He wears them in his races and works and trainer Graham Motion wanted to do a little experimenting with them this morning. 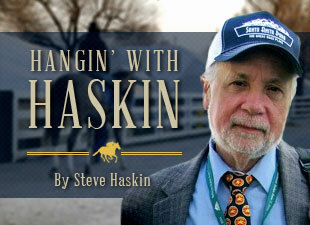 Like Shackleford, he is improving at the right time and still has more room for improvement. The big question with him is how he’ll handle the dirt in a 20-horse field. We’re not sure how the public will be playing horses like Nehro, Pants On Fire, Midnight Interlude, and Soldat. Check their odds throughout the day and see if any of them appear to be overlays, especially Nehro and Pants on Fire. So, to recap the sure bets, it’s Archarcharch to win (and Nehro if he's a decent price), with longshot savers on Brilliant Speed, Master of Hounds, Shackleford, and Animal Kingdom. We might add Pants on Fire if his odds are high enough, but we're getting into too many horses. In the exotics, there is the flashback box of Dialed In, Mucho Macho Man, Soldat, Santiva, Stay Thirsty, and Archarcharcharch. The George Costanza box was mostly in fun, but you know what? It’s a pretty good group and looks strong enough to bet. Finally, in case of a sloppy track, we have a different scenario. Here in our opinion are the best bets in the slop – Pants On Fire, Soldat, Shackleford, Brilliant Speed, Nehro, Stay Thirsty, and Twice the Appeal. There are going to be some awfully big prices among this group. And you have the grass/synthetic horses Animal Kingdom and Master of Hounds to consider. Of these, you won't find a better pedigree for the slop than Shackleford. He is inbred to Dr. Fager and In Reality, and has Aspidistra three times. His broodmare sire is Unbridled. Other major slop influences in his pedigree are Pleasant Colony/His Majesty, Speak John, and Buckpasser. This also is the family of slop influence Gone West. He also has the right running style for a sealed sloppy track.